Federal judges in California approved of Lending Club's settlement of its 2-year running class action lawsuit with some shareholders. The essence of the suit described well by our friends at Crowdfund Insider, covers a period from 2014 through May 2016. Those of you who were investing in p2p lending at that time, like many of you and me, remember that time well. Spring 2016 was the time when the fraudulent loan mess happened at Lending Club and founder Renaud LaPlanche was ousted from the company. The resulting drop in the stock price and need for LC to recover some of its reputation in the marketplace led to a suit by some of the shareholders. The suit alleges breach of fiduciary duty, which is a very serious charge for a financial company. LC is supposed to act for the benefit of its shareholders and the breach allegation means LC has not done so. Per the company's press release, the settlement for $125 million, which includes $77 million of their own cash, was factored into Q4 Revenue and Net Income numbers and part of the $154 million net loss reported for 2017. The stock currently trades at $3.65 before market open today and I've never advocated buying the stock and I still don't. I do still advocate making loans for the platform as an investment as one of the 7 open to retail investors that I cover in my book: P2P Investing 101. Have you checked it out yet? 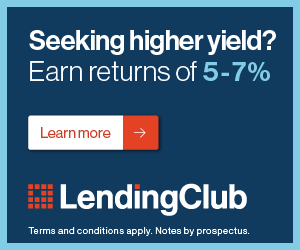 Returns are down but Lending Club still presents a solid platform for investment compared to other fixed-income options like bonds. This news, which allows LC to put this all behind them and move forward, is a good thing.